The boyfriend and I last week had two nights away the first on the itinerary was Sheffield to see bands, Dan Reed Network and Tyketto since the boyfriend is a massive fan. Sheffield is a Northern city located in South Yorkshire; it's approximately 130 miles from Newcastle, and it takes about an hour and forty-five minutes on the train. Sheffield is a typical Northern city that expanded during the industrial revelation in the 19th century; the city gained international renown for its steel. Like many other Northern cities, Sheffield experienced a downturn in their economy during the 1970's and 80's due to international competition and also the closure of the coal mines contributed. In 90's and early 21st century, the experienced redevelopment through investment to the city. We first visited the Millennium Gallery; the museums opened in 2001 and has two permanent collections. The first is the John Ruskin collections; Ruskin was a Victorian scholar and philanthropist who strived to address the gap between the lower and upper classes. During the 19th Century as cities expanding workers experienced poverty and harsh living conditions. Ruskin wanted to inspire the workers, so he set up the Guild of St George's. He established a museum of artwork, illustrated books, and minerals that he felt represented beauty, and the museum was free for all. Renaissance art, gothic architecture, engravings, mosaic decoration, illustration, illustrated books and medieval manuscripts. The collection still serves as inspiration for visitors today. The second permanent exhibition is of Sheffield's Metalwork collections displaying a broad range of cutlery, flatware, and tableware.The photos below are of my favorite items; I love the dragon and the griffin knife and folk. I would love to have these on display as I love mythical creatures. It's astounding considering the amount of work involved to create it. The person who commissioned the cutely appeared to want to impress their guests and show their wealth. I imagine eating with them incredibly difficult. I didn't take photos of the other exhibitions. One of the tempory exhibitions evaluating John Ruskin's idealism through arrange of different art and craft mediums exploring how Ruskin impacted society during his lifetime, and he continues to influence contemporary society. The final exhibition was based on arts and crafts looking at traditional skills that were used in daily life. Examples of an elaborate hand embroidery, tapestry lace, and paintings. One of my favorite exhibitions was a cream dress with black embroidery from the 15th-century. One example of contemporary crafts was a quilt made by inmates of Wandsworth Prisoner. 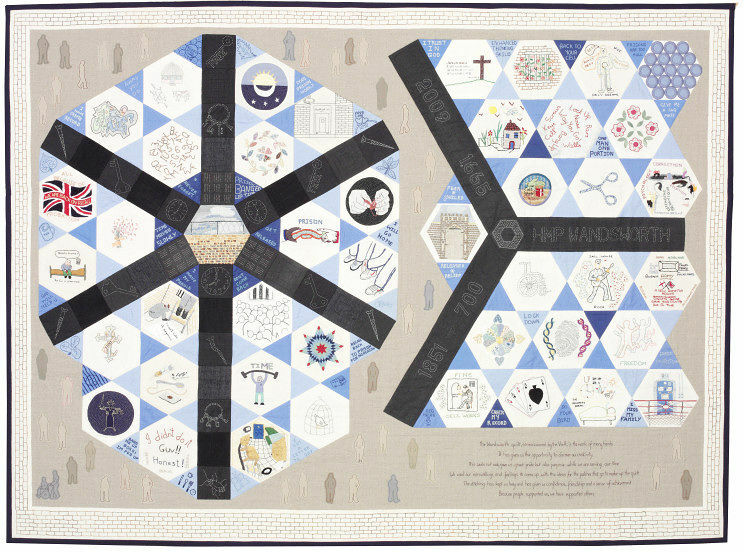 The prisoner worked with a charity, Fine Cell Work that teaches crafts to prisoners enabling to occupy their time when confined The quilt's design is based on the prison layout and the material and colours were either the same colour or weave of the inmates uniform The quilt uses a hexagon design sewn over paper; each hexagon depicts the prisoner's daily life. It's unusual to consider men quilting as traditionaly it's was a woman occupation and I've mainly met women who quilt. I would never have thought of prisoners quilting. I assume that's the whole purpose is to challenge preconceived ideas and highlights the therapeutic benefits can have on people. The Winter Gardens is an indoor tropical garden found in the heart of the city with a variety of evergreen and tropical plants. The garden is recorded as Europe's largest Urban glass house. The building acts as a large corridor with a variety of shops and restaurants. Personally, I was disappointed by the gardens and felt the garden layout was too sporadic. the architect focused too many facilitates and creating a more of walkthrough rather than a tranquil garden, perhaps I'm missing the concept. Despite my personal feelings, I found some interesting plants to photographs. I love the vivid and vibrant colors of the flowers, especially the magenta, pinks, and purples, which are my favorite colors excluding black. The gallery displays a range of British and European traditional and contemporary art. Sheffield holds work from Turner, Cezanne, Sisley, and Brigit Riley. Personally, the gallery was ok to wander around, especially for free entry I can't complain. The gallery did display an some interesting pieces of artwork. After walking around, we found a pub, Henry's to rest and ordered food. 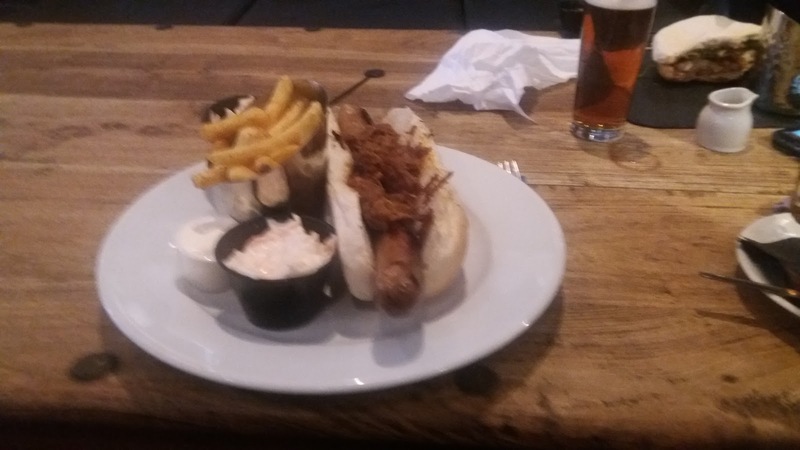 I ordered the pulled pork and hot dog. The portions were huge, and we both struggled to eat it. The Cathedral was worth visiting it's rather small in comparison to other Cathedral. However, it has a unique aesthetic with the fusion of 20th-century architecture and medieval gothic. The cathedrals was built in the 12 century by William de Lovetot. The church was demolished in 1280 and later rebuilt in 1430. The North and South naive were restored in 1790-93. In 1914, the church became a cathedral. The exterior appears to look mismatched but in the interior, the modern architecture blends in more effectively with its current interruption of gothic, With the high arches and stained glass flooding colour light into the building I got a sense of what the medieval people may of experienced when first entering the newly built cathedral. Below is the tower lantern, built in 1966 as a way to allow more light into the church and the abstract glass was a later addition, installed in the late 90's and designed by Amber Hiscott. Below is the photo of St George's Chapel that commemorates the Yorkshire and Lancashire Regiments its decorate with coronal flags. One of my favourite parts of the Cathedral was the fence made of the regiment's bayonets and swords. We later went to see the bands Dan Reed Network and Tyketto, who played a brilliant set up my favourite, was the Dan Reed Network who I 've seen play twice; I'm not a huge fan of either band but do enjoy a few of their songs. However, both are exceptionally talented and have boundless energy when on stage. Afterwards, we even got to meet the bands who appeared to seem friendly and appreciative of their fans support. They stood around chatting to people and intermingling with the crowds . They both stated they enjoy spending time in the UK as the two lead singers are performing acoustic set later on in the year. The boyfriend bought tickets. We planned to leave the next day for York, but I had the morning to look around. I left boyfriend in bed to sleep, while I went to look around the charity shops and explore Moor Market. Sheffield has had Market since 1296 when Thomas de Furnival, Lord of the Manor of Sheffield. 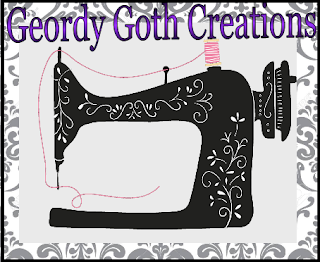 was granted a market from Edward I. Moor Market is an independent mark selling an array of good including international foods, clothing, haberdasheries, and cafes I had a quick look around and purchased fabric. I found a couple of items, a long sleeved top with leatherette trim around the neck by Primark and a cheap cat toiletry bag for 75 pence. Sheffield Town Hall and Peace Gardens. On my way back to the hotel, I had a quick gander around the impressive Sheffield Town Hall, like many of the Town Halls in the North many wanted to illustrate the wealth of the city by building grandiose public offices. From the exterior the town hall it makes me thinks of the imposing chateau from Beauty and the Beast that the Beast resides in I'm a huge Disney Fan, and I love Beauty and the Beast, The building has a very European feel and reminds me of some of the architecture in Germany and Belgium. The Town Hall was built between 1890-97; it was opened in 1897 by Queen Victoria and designed by London architect E. W. Mountford. Originally, there was a competition for architecture to submit plans for the town hall. I wandered into city hall to browse at the interior and photographs the architecture and stone carvings. The interior was no less impressive and opulent. The atrium has a grand staircase with many walls carvings of a different of a local legend. At the bottom of the stairs is a statue of the first Lord Mayor of Sheffield, the Duke of Norfolk donning the Knight of Garter robes with the Lord Mayor garb. While wandering about and looking in the hallway I was offered the opportunity to be shown around the building, so I opted for the tour. The person who showed me around, he was even a Lord Mayor of Sheffield at one point. They explained some of the history of the building who designed and built it, the statue of the first Lord of Mayor, and how Queen Victoria opened the Town Hall. He explained that the walls were lined with veined Derbyshire and Devonshire marble. The colors alternative to creating a contrasting display. The ceiling allows light to flood into the building even on the grey morning there was still ample amounts of light in the illuminating the interior. On the wall below are carved images on alabaster depicting trades, arts, crafts and music. One of my favorite carvings was the battle of the Dragon and the knight and attempting to save the maidens depicted below. The local legend of the Wharncliffe worm. The Knight of Moore Hall slayed the Wharncliffe dragon with his bare hands. The legend is believed to depict the power struggle between the two Earls of Wharncliffe and the lords of More Hall. The guide explained that many people confused the tail for George and the Dragon. I was shown around the reception suite, a meeting room that had pictures of all the Lord Mayors since the Lord of Norfolk was the first Mayor. My guide highlighted two photos the first female Mayor Ann Eliza Longden, who elected 1936, which was very progressive at the time considering the women in the UK only got the right to Vote in 1928. My guide also pointed out his picture of him when he was Lord Mayor. An interesting thing the guide mentioned was the shield depicting the of two carved men who are meant to represent Vulcan the Roman God of manufacturing of manufacturer of art, arms, iron, jewelry, and armor for the Gods.Thor the Nordic God who welded the Hammer, protecting making. The gods are entirely choosing considering Sheffield' industrial and manufacturing heritage. Wow, what an interesting trip! So many artistic and historical places! Thanks it was great change and quite fun. Sounds fab, you managed to pack quite a lot into a short time. I'm surprised how much I got in but then again there's not a huge a amount to do in Sheffield.